Yesterday's baby shower for daughter Emily was a huge success. We had a beautiful day for the brunch at the Five Ponds Golf Club (Warminster, PA). Forty guests showered Emily and Baby Girl ("Charlotte Grace") with niceties and necessities. The candy buffet was a hit -- I can't believe all that candy (woosh) went and there are no leftovers. Today was a day to unwind after months of preparation, and to make some Thank You cards for my dear co-hosts, who include the two other Grandmothers (Sherry Michaels and Margaret Cohick) and Emily's godmother Mary Beth Hume (my sister). They were all generous with their time and contributions, even though they live 6-10 hours away! Here is the card I made for them. 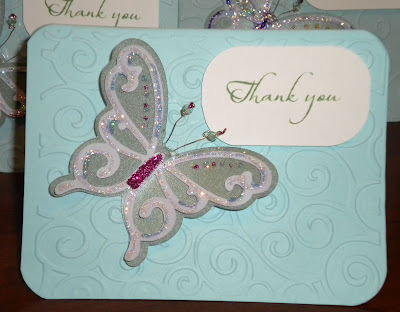 I used a Cuttlebug embossing card to create the raised swooshes, and cut the butterfly using Cricut "Cake Basics" cartridge. The butterflies were decorated using Stickles; their antennae were gold wires highlighted by Swarovski crystals. The raised "Thank you" sentiment was given dimension with pop dots. I've made a few more cards this weekend, which I'll be unveiling in the days ahead. Stay tuned!